OWL 2 Web Ontology Language: Manchester Syntax Matthew Horridge, Peter F. Patel-Schneider. W3C Working Group Note, 27 October 2009, http://www.w3.org/TR/2009/NOTE-owl2-manchester-syntax-20091027/. Latest version available at http://www.w3.org/TR/owl2-manchester-syntax/. OWL 2 Web Ontology Language: New Features and Rationale Christine Golbreich, Evan K. Wallace, eds. W3C Recommendation, 27 October 2009, http://www.w3.org/TR/2009/REC-owl2-new-features-20091027/. Latest version available at http://www.w3.org/TR/owl2-new-features/. OWL 2 Web Ontology Language: Profiles Boris Motik, Bernardo Cuenca Grau, Ian Horrocks, Zhe Wu, Achille Fokoue, Carsten Lutz, eds. W3C Recommendation, 27 October 2009, http://www.w3.org/TR/2009/REC-owl2-profiles-20091027/. Latest version available at http://www.w3.org/TR/owl2-profiles/. OWL 2 Web Ontology Language: Quick Reference Guide Jie Bao, Elisa F. Kendall, Deborah L. McGuinness, Peter F. Patel-Schneider, eds. W3C Recommendation, 27 October 2009, http://www.w3.org/TR/2009/REC-owl2-quick-reference-20091027/. Latest version available at http://www.w3.org/TR/owl2-quick-reference/. 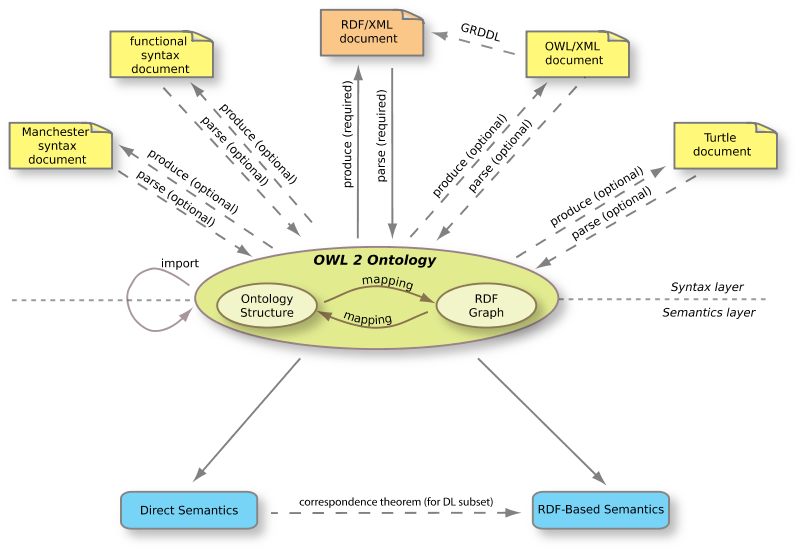 OWL 2 Web Ontology Language: XML Serialization Boris Motik, Bijan Parsia, Peter F. Patel-Schneider, eds. W3C Recommendation, 27 October 2009, http://www.w3.org/TR/2009/REC-owl2-xml-serialization-20091027/. Latest version available at http://www.w3.org/TR/owl2-xml-serialization/. Turtle - Terse RDF Triple Language . David Beckett and Tim Berners-Lee. W3C Team Submission, 14 January 2008, http://www.w3.org/TeamSubmission/2008/SUBM-turtle-20080114/. Latest version available at http://www.w3.org/TeamSubmission/turtle/. OMG Unified Modeling Language (OMG UML), Infrastructure, V2.1.2 . Object Management Group, OMG Available Specification, November 2007, http://www.omg.org/spec/UML/2.1.2/Infrastructure/PDF/.